Keep a bag of potato wedges in the freezer and you can have this easy dish on the table in around half an hour. The Columbian Blacktail eggs used are exclusive to Waitrose and are laid by hens with 33 per cent more space than standard free range hens. Softly set eggs with crispy golden potatoes are a winning combination and make great comfort food for any time of day. Preheat the oven to 230°C, gas mark 8. Spread out the potato wedges in a large non-stick roasting tin and cook for 5 minutes. Meanwhile, trim the salad onions and cut each one into five pieces. Remove the potato from the oven and scatter with the salad onions and cherry tomatoes. Season and drizzle with the olive oil, then toss together lightly. Sprinkle with paprika and cook for a further 15 minutes until the potato wedges are crispy. Make four gaps in the potatoes and crack an egg into each gap. Season each egg with a little salt and pepper and return to the oven for 3 minutes or until the eggs are softly set. Carefully scoop 2 eggs, some potato wedges and tomatoes onto each plate using a fish slice and serve with tomato ketchup or mayonnaise. 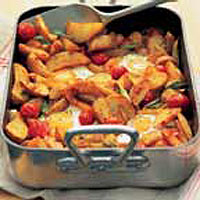 Cut 4-5 regular tomatoes into wedges and use instead of the cherry tomatoes. Crack the eggs, one at a time, into a cup - it will be easier to pour them into the gaps in the wedges. Note: This recipe contains lightly cooked egg and is not suitable for elderly people, young children, pregnant women or those whose immune systems are weak. Waitrose Strong Dry Cider would be just right, and perfect for a casual lunch or supper.